This section describes the TICS Eclipse Plugin. This plugin can be used in Eclipse 3.4+ and versions of Wind River Workbench based on Eclipse 3.4+. 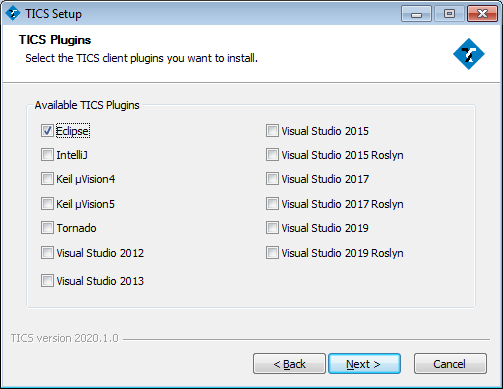 There are two ways to install the Eclipse plugin: manually or through the TICS Installer. 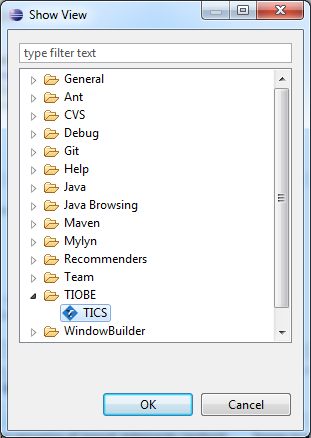 Under Windows, the easiest way to install the TICS Plugin is to use the TICS installer. When getting to the TICS Add-ins dialog, select Eclipse. The TICS Add-ins step in the TICS installer. Add the TICS Plugin to Eclipse without installer. Here, the version number (8.0.0.v30413) may differ. The latter plugin is for CDT (C/C++) development in Eclipse. The former plugin is for Java (JDT) development. You can install both without any trouble. Follow the steps to add this plugin to your Eclipse environment. 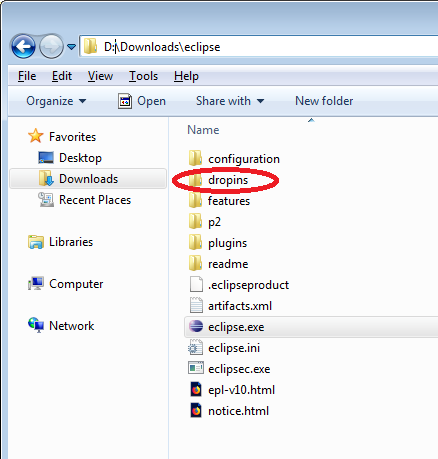 Find the directory that holds eclipse.exe (e.g., D:\eclipse\eclipse.exe). Go to the plugins directory (e,g., D:\eclipse\plugins). Copy the plugin(s) (the .jar files from above) into this directory. Restart Eclipse: eclipse -clean. Use -clean to force a clean start. The TICS icons will be visible in the toolbar. 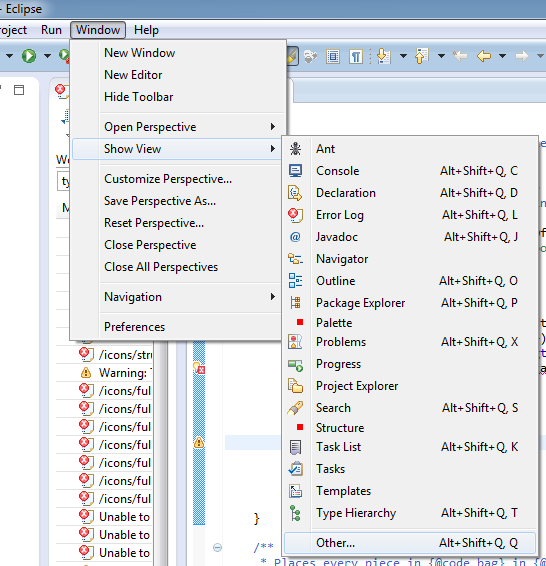 The TICS Eclipse Plugin provides a toolbar with four buttons. The Eclipse workspace with the TICS buttons. The TICS buttons have the following meaning. Analyze the active File: clicking this button starts the TICS analysis. It results in an overview of the violations of the available coding standards. Analyze all files in project: clicking this button starts analyzing all files in the current vcproj project file. It results in a consolidated overview for all files in the project. Cancel analysis: clicking this button cancels the TICS run. 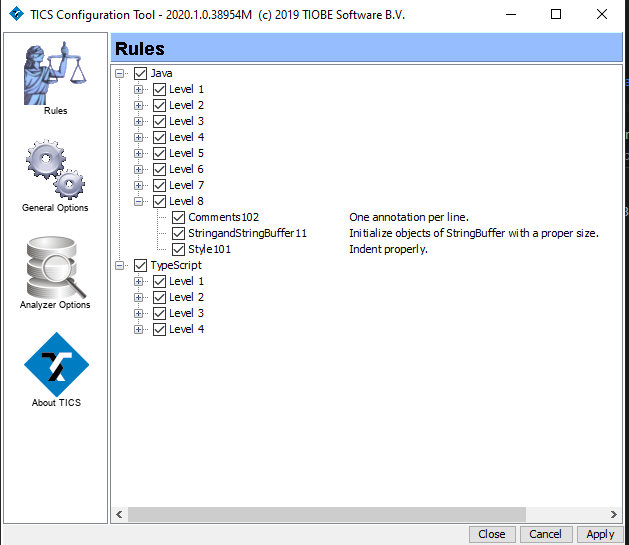 Rules and Options configuration: clicking this button opens the TICS Configuration Tool. This tool can be used to configure the behaviour of the TICS Client. The Rules tab: specify which violations to show. The rules are categorized by language and by level. Rules can be switched on and off per level or individually. 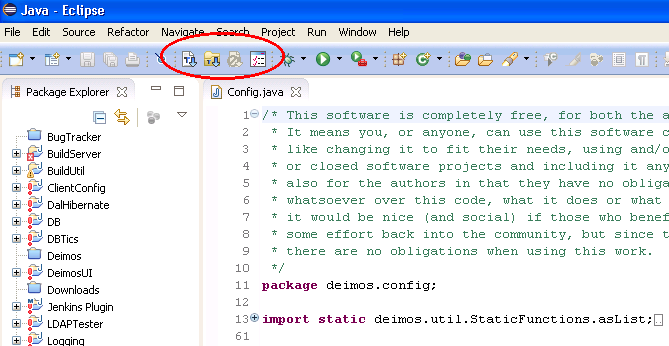 If a rule has been switched off it is not shown anymore in the output window of Eclipse. Note that hidden violations are still detected and being used for statistical overviews. You can right-click on a rule for its documentation. The settings specified by the user are saved in the HIDDEN.txt file. The tab General Options provides general TICS options. 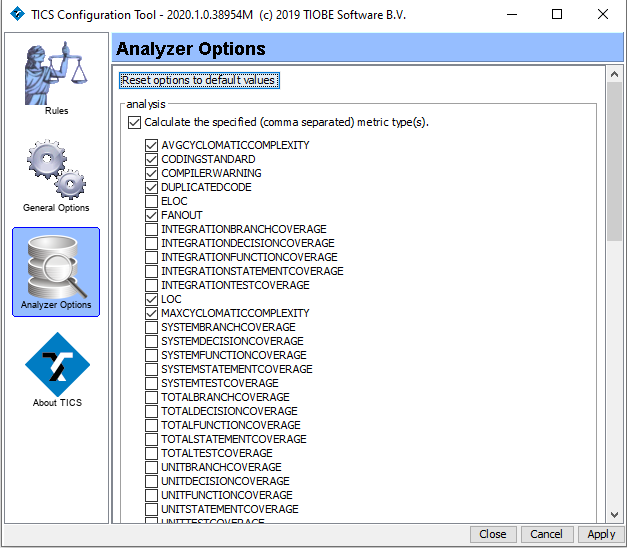 The tab Analyzer Options provides options for the TICS analyzer. 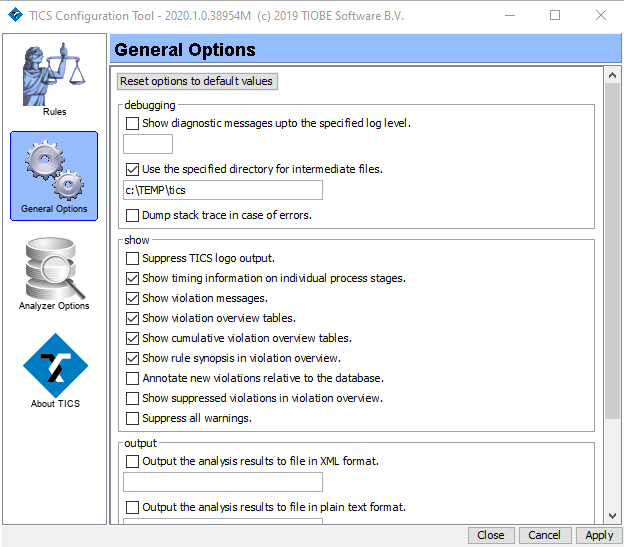 The TICS Eclipse Plugin also provides a new pane in which the violations can be viewed, sorted, and filtered. Opening the Show View dialog. In the dialog that is opened, select TICS under TIOBE and click the OK button. The TICS Pane is shown in the image below. Hiding markers; this can be done by unchecking the checkboxes in front of violations. Sorting; this can be done by clicking column headers. Showing new violations only; this can be done through a checkbox in the View menu. Filtering violations; this can be done through the Adjust filters dialog. This dialog can be opened by clicking the button in the top-right corner of the TICS Pane (see below). The button that opens the Adjust filters dialog. The icon for this button can either be filled (shown above) or open. An open filter means no filter are currently applied. A filled filter means the results are filtered. From the Adjust filters dialog, a user can select the values for which violations should still be shown. The filters for all columns are combined. 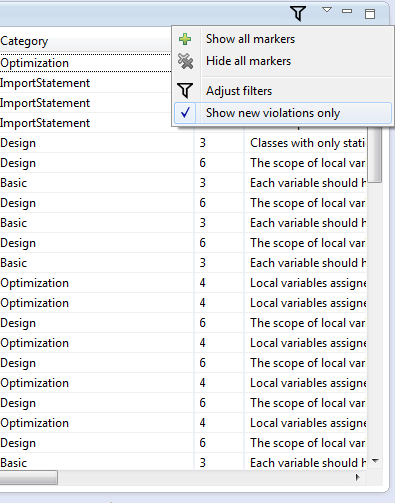 So when applying the filters shown above, violations will be hidden if they either belong to the Basic category or belong to rule Design1. 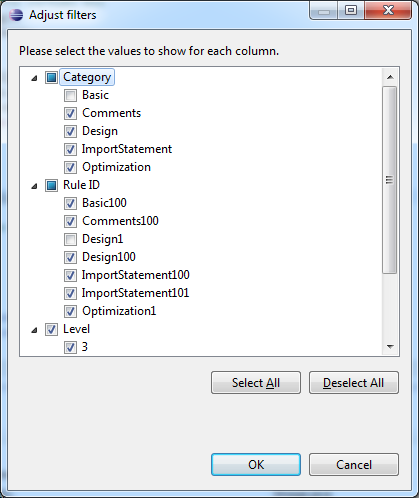 Deselecting all values in a column has no sensible meaning; it will hide all violations regardless of the values in other columns!